The TV Smiles app is a fun and easy way to earn a little extra cash. It is available on both iOS and Android devices. To download the app click here. So how do I earn money with TV Smiles? There are three ways to earn money with the TV Smiles app. The first and easiest way is to answer all the questions on the quiz cards. Each card will have three sections and will be worth between 8 and 36 points. Questions vary in format from true or false to anagrams or predicting where the football is on an edited image, you get multiple chances to find the correct answer. Some quiz cards have a special question at the end which is one try only, if you get this question correct then you will be put into a prize draw. Prizes so far have included games consoles, 50,000 Smiles, TVs, iPads and more. The second way to earn smiles points is to complete offers. Offers can be both paid or free; for example you can get Smiles points for placing a bet at a specified bookie, you can also get points for downloading and trying out a free app or watching a short video. I tend to avoid any offer that will cost me money, if I am specifically interested in the promotion it is likely I will get a better rate of return through a cashback website such as Quidco or Top CashBack. You can earn around 15p worth of smiles points for simply downloading an app and then opening it, it might not seem like a lot of money but it takes seconds and the cash does build up quickly. The minute your points have credited you can delete the app off your device if it is not something you are interested in keeping. The third way to earn cash from the TV Smiles app is to enable the microphone on your device, whilst you are watching telly the app will monitor the adverts being shown and if it hears one it recognises it will award you extra points. Certain adverts will trigger new cards to appear in the app. Everyday you will be given a card to complete with three specified adverts to listen out for, if you click on the tv icons it will tell you the brand and product of the advert to be looking out for. Why do I use the TV Smiles app? I find that when I am sat chilling in from of the telly watching my favourite shows I also tend to fiddle with my phone a lot, especially during the adverts. I play games on my phone or do silly FaceBook quizzes whilst I wait for the show to come back. I found myself to be wasting a lot of time playing mindless games, there had to be something more productive I could do in the breaks of the shows. I started looking for apps that you can use to make money and thats where I came across TV Smiles. I tried the app out and soon came to realise that it was the perfect answer I was looking for. I can still do simple silly quizzes, I can still download apps and plays games but the bonus here is that I get paid for it! It is not at all taxing on the brain so is perfect for when you are chilling, I play it for a while before I go to sleep every night too. What can I spend my Smiles points on? In the Smiles Shop there are many rewards you can exchange your Smiles points for. You can exchange points for entries into competitions to win big ticket items, I have not done this because I personally do not like pay to enter competitions. You can exchange your Smiles points for cash paid via PayPal, the minimum pay out for PayPal is just £2.00. There are also gift cards for popular shops available such as Amazon and Marks & Spencers, these do work out at a slightly better value for example £10.00 cash is 29,900 Smiles points whereas £10.00 Amazon gift voucher is just 27,900 Smiles points. If you are saving to make a purchase this would be the better option in the long term. Finally you can also exchange your Smiles points for big ticket items such as games consoles and TVs however you would be much better taking the cash and buying the item with that as the exchange value works out much better that way. Is TV Smiles a con? Will I really get my money? No TV Smiles is not a con, it is a legitimate and perfectly safe way to earn yourself a few extra pennies. 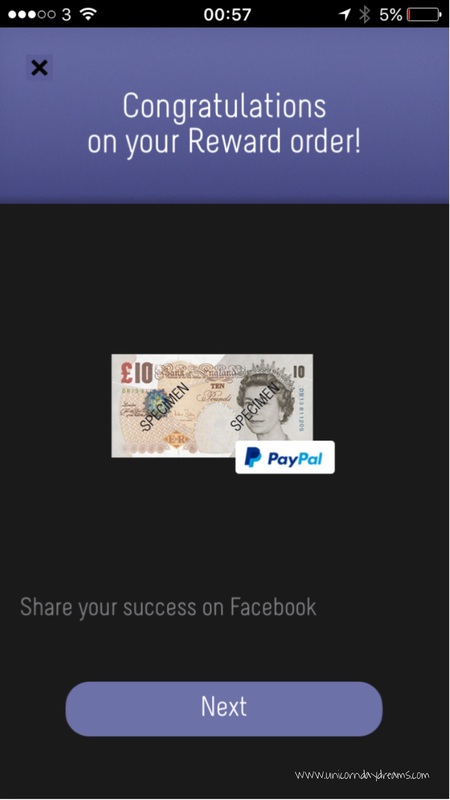 I have cashed out £10.00 and am now working on my next completely free tenner. I reckon the TV Smiles app is worth trying if you are looking for a super simple way to make some extra cash. It is by no means going to make you rich quickly however I earnt £10.00 doing things I would normally already do for fun so the cash is really a nice bonus. To download the app you can click here. Do you already use TV Smiles? Will you be giving it a go? Let me know how you get on, please leave me a comment or send me a tweet, I really do love hearing from you!